MorganStanleyGate: Corrupt Kansas Officials Continue OBVIOUS Paternity Fraud . . . Corrupt Kansas Officials Continue OBVIOUS Paternity Fraud . . . The below message on the corruption-laden actions of Kansas Judge Ron L. Svaty was emailed today to a Kansas Public Official, who is profoundly incompetent and/or criminally corrupt. Her name is Phyllis Gilmore, and a variety of other Kansas officials were copied on it. Ms. Gilmore appears to be an exemplary figure of kakistocracy, and Federal criminal "Color of Law" charges have been filed against her. Stop this OBVIOUS Paternity FRAUD -- overwhelming evidence has been provided and posted on-line. What more do you want me to do, stand on my head? This was perpetrated by a corrupt judge (Ron L. Svaty) from a rural Kansas County I’ve never stepped foot in. The “pawn” in this charade is a FIVE-time felon, Leah Krier, whom together with her son have ALWAYS been residents of North Carolina. Thus according to operative law (the UCCJEA) the home state is NOT Kansas, and the UCCJEA also specifically prohibits jurisdiction shopping. Ms. Krier has already stolen over $200,000 of my personal property including a Mercedes Benz S320. This property was involuntarily placed in storage after the worst bank foreclosure fraud in US history (Google this, and I’ll be your #1 returned result), which culminated in my being violently evicted by a SWAT team on a mortgage PAID-IN-FULL ! Svaty has NO jurisdiction in this canard and 15 independent sources prove this. Moreover, the child is NOT mine and DNA evidence would prove this. Nevertheless, if the child was mine, the paternity claim has already been PREPAID THRU ADULTHOOD via the aforesaid theft, and I would then seek full custody. I naturally have a right to know this, which has been simply ignored. I can’t pay the BOGUS paternity claim as my eight-figure net worth was stolen in the foreclosure fraud. And although I am in the process of trying to recover my stolen net worth . . . I have barely enough money to survive myself and support my 88 year old mother. Thus garnishing my bank account causes unimaginable hardship. Svaty KNOWS this and was paid off to orchestrate this insidious scheme. I was tipped off to his plans, which call for arranging MY false arrest for failing to pay this FRAUDULENT paternity claim. And during this arrest, I am to be murdered. A weapon is to be planted, along with a FALSE representation that I resisted arrest while brandishing deadly force. If this diabolical assassination can’t be executed, then alternative arrangements will be made while I am UNLAWFULLY incarcerated. 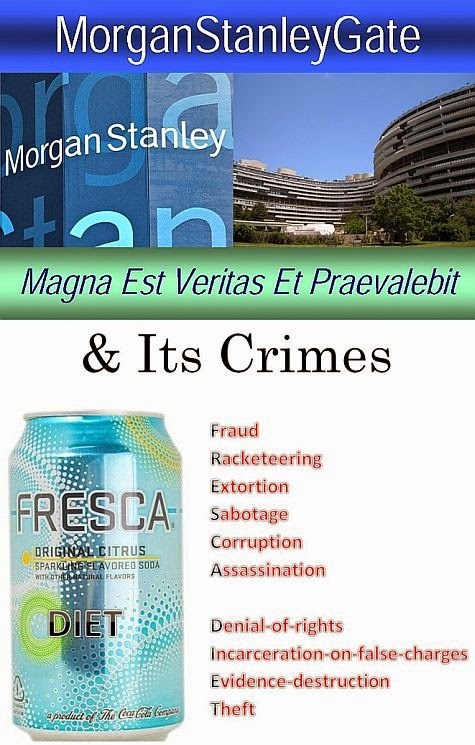 AS YOU WELL KNOW, such dastardly actions are intended to cover up a surfeit of crimes in a scandal of epic proportion, known as MorganStanleyGate, which literally involves $ billions in franchise value. These crimes are so numerous, someone as cognitively challenged as you needs a mnemonic devise to remember them, [and is reflected in the image above].